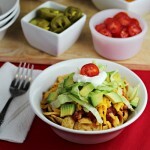 Easy Frito Bowls with Meat Sauce is an easy dinner that’s great for family dinners or when you have a crowd to feed. With only a few ingredients, plus your favorite toppings to choose from, it’s a crowd pleaser. Frito Bowls with Meat Sauce is a meal I have made a lot over the years. It can be made in no time, it’s cheap to make, and it’s always a crowd pleaser. Go meatless and use only beans and/or vegetables, like onions, peppers, squash, corn, etc. Add drained diced tomatoes with the tomato puree if you like things a bit more chunky. We do recommend using a good quality tomato puree that says “not from concentrate”. Recently we’ve been really enjoying Cento Tomato Puree, which you can buy in grocery stores in the canned tomato aisle or online. For the salsa, use a salsa that you enjoy, with plenty of flavor. We recommend using a chunky salsa. Frito Bowls with Meat Sauce also double or triple easily if you have a crowd to feed, which makes it even better for game day and tailgating. Here’s how easy it is: in a pot, cook up 1 pound of ground beef or turkey with chopped onion. 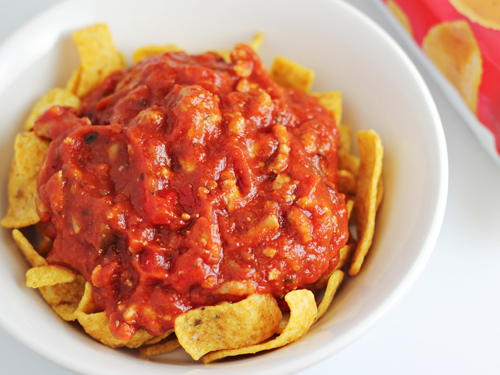 A can of tomato puree, a jar of salsa, and some chili powder are mixed in. All of this is heated up and simmered a bit. Each person puts a big handful of corn chips into their own bowl and spoons the meat mixture over them. The best part of all is the toppings. I like to have lots of options like shredded cheese, shredded lettuce, tomatoes, jalapenos, avocados, and sour cream. 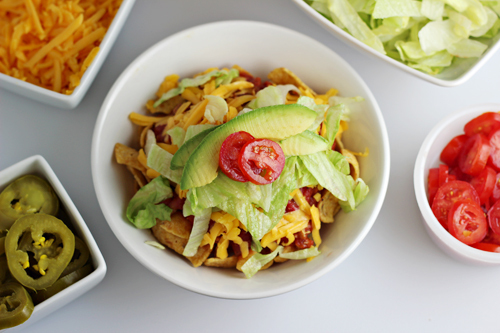 Each person adds the toppings they like, so in our house, everyone’s bowl of Frito Bowl looks different. Here’s the recipe for you to print — if you like this recipe, be sure to pin it on Pinterest or share on Facebook! 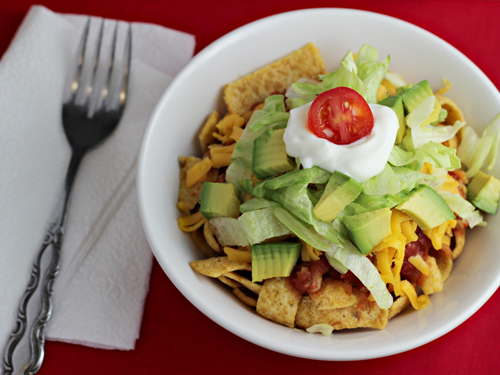 Optional Toppings: shredded cheese, shredded lettuce, chopped tomatoes, sour cream, salsa, avocado, guacamole, sliced jalapenos, etc. In pot, cook ground beef or turkey until done; drain if necessary. Add salsa and tomato puree to the meat. Allow to simmer on low-medium heat until thoroughly heated, approximately 10-15 minutes, stirring occasionally. In individual bowls, each person places a large handful of corn chips. Top the corn chips with a spoonful or two of the meat mixture, and then with desired toppings. –This recipe makes approximately 6 cups of meat sauce. An average serving is about 1 cup of meat sauce to a handful (or so) of corn chips. This varies though as some people may prefer more sauce. Looks yummy. Pinned & sharing Thanks for joining the Inspiration Spotlight party. Thanks for sharing with us at Family Joy Blog linkup. Sometimes the easy dishes are also favorites for your family aren’t they? Awesome! 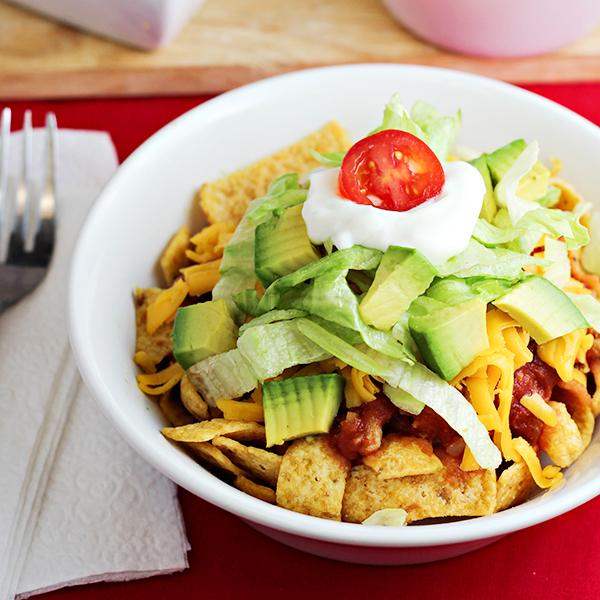 who does not love a bowl of Frito goodness? Thanks for bringing to the party this week! This looks amazing. I love the crunchiness of the Frito. 😀 MMMMMM. I love how you changed the name over the years 🙂 Frito Ole is really cute. This looks like just the perfect tailgate food! 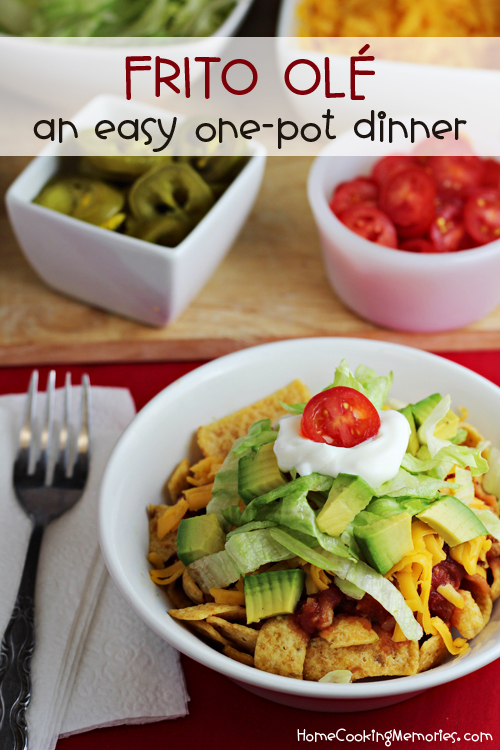 What a super fun idea for any dinner! This kind of reminds me of an inside out walking taco! All the flavors from the classic treat but in a more customizable form. Love it! That’s a big bowl o’ yum! Oh man…my family would LOVE this! YUM! An open bag of Fritos is a dangerous thing to have around me. Then you go piling tasty toppings on them and wow! Love it! YAY! I love this recipe. I think I need to pick up a bag of fritos at the store today! Oh yum. Fritos are a total guilty pleasure for me. Add them to a recipe and I’m usually sold. This looks FANTASTIC and will definitely be on my to make list! As a Texans, ANYTHING with Fritos is near and dear to my heart…this one’s going to be on my menu this football season FOR SURE! Yum! What a great dinner!! LOVE it!! What a great and filling dinner for a tailgate. I like recipes with a bunch of toppings and everyone gets to pick their own. It definitely makes it more fun.